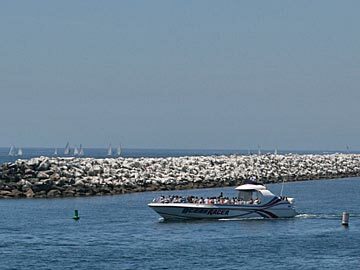 Redondo Beach Int'l Boardwalk has restaurants and bars, curio shops, ocean views and more. It is a large pier where you can walk around, people watch or browse stores. There are a few eateries where you can buy fresh seafood and have it prepared for you. From LAX, a bus ride takes 30-60 minutes each way (including transfers). From LAX, a bus ride takes less than 15 minutes each way (including transfers). Take Torrance #3 from the bus terminal near the south end of the Pier, to Del Amo Center bus stop. If you want to stroll around the pier, plus visit some shops and get something to eat, give yourself at least two hours, plus travel time. So you will realistically need at least a 4 hour layover for this excursion. On planning for your return trip to LAX, don't forget to allow an additional hour to get through security and walking through the terminal at LAX.